XenoPort Inc. (XNPT) spiked 65 percent to $10.49 and rallied to $11.34 earlier, the most intraday since the shares were listed in June 2005, after the drugmaker and partner in commercialization GlaxoSmithKline Plc (GSK) won US approval to sell a new drug, Horizant, for restless legs syndrome [RLS]after more than a year of delays. The FDA asked in February 2010 for more information about Horizant’s early studies. The delay led XenoPort to fire half its staff, or more than 100 jobs. XenoPort plans to introduce the drug July 1 with the help of Glaxo’s sales force. “We think it’s a great example of a company able to work with the FDA to clear up misconceptions, suggesting the agency indeed can still work rationally with biotech companies,” said Michael Yee, an analyst with RBC Capital Markets in San Francisco, in an e-mail to Bloomberg. Horizant may bring in at least $100 million a year in U.S. sales, Yee said. Analysts at Deutsche Bank (DB) raised their rating on the stock to Buy from Hold. Horizant was developed by XenoPort and licensed to London-based Glaxo. From a technical perspective, XNPT has broken out violently to the upside during Thursday’s trading session. The shares, which have declined sharply since February 17, 2010 ($19.60), have surged on heavy volume with more than 19 million shares already trading hands compared to a daily average volume of just 813,000. XenoPort would have first major support at $10.00 while resistance would be the 52 week high at $11.82. In its share capital XNPT has 35.26 million outstanding shares among them 25.17 million shares have been floated in market exchange. XNPT stock institutional ownership remain heavy at 87.10%. Percentage held by insiders is at 16.11%. 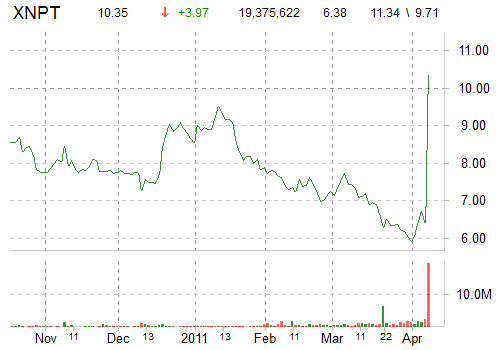 In late morning trading, XenoPort rose $4.05, or 63.48%, to $10.43. Disclosure: I currently hold no position, long or short, in Santa Clara, California – based XenoPort, Inc.